Here is a listing of S&S 34’s found to be for sale around the world. See if you can grab a great yacht!! Ciella For Sale. Derek has had to abort his round the world trek and Ciella is now for sale. Details to follow but she is listed under our yacht directory with photos. Of course you can still get a new S&S 34 built to your specifications! Contact Mike Finn at Cottesloe Yachts. Ring Mike on +61 419 845336. 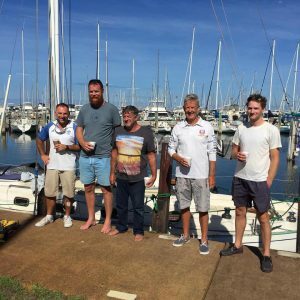 S&S 34 Huckleberry skippered by Phil Somerville Ryan has won the 71st Bunbury & Return Ocean Race off the coast of Western Australia against a field of 10 other yachts. Huckleberry entered in Division 2 for the 170Nm race and took first in both YAH and IRC handicaps in that division. She also won the overall race and the Siska Cup for this result. 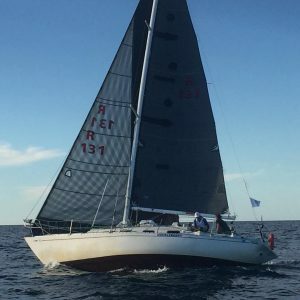 She was the only S&S 34 in the race and was pitted against many faster and highly skilled yachts including a TP42, Dirty Deeds, which took line honours. In the light conditions good tactical decisions by Phil made all the difference. Congratulations Phil, crew & Huckleberry!!! Huckleberry rounding the last mark in the 71st Bunbury and Return Ocean Race. The S&S Association based in the UK has named Komatsu Azzurro, skippered by Shane Kearns as winner of the 2018 Global Regatta. The Global Regatta is a racing competition between the regions of the S&S Association. The prize, the challenge Cup is awarded at the AGM to the yacht that in the preceding year, secured a class or overall win by the greatest margin relative to the next placed yacht, in either an offshore or around the cans race. Komatsu Azzurro won the regatta based its performance in the 2018 Sydney Gold Coast Yacht Race.